Following waves of pressure over the controversial Dakota Access Pipeline (DAPL), US Bancorp (US Bank) CEO Andrew Cecere won praise from Indigenous rights and climate advocates when he announced to shareholders in April 2017 that US Bank would stop financing oil and gas pipelines. Despite this landmark commitment, over the course of the last year, US Bank supplied finance worth more than USD 2 billion to companies building oil and gas pipelines. 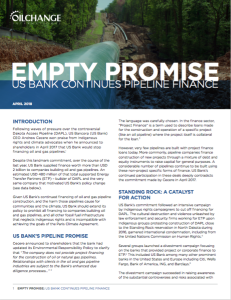 An estimated USD 480 million of that total supported Energy Transfer Partners (ETP) – builder of DAPL and the very same company that motivated US Bank’s policy change. 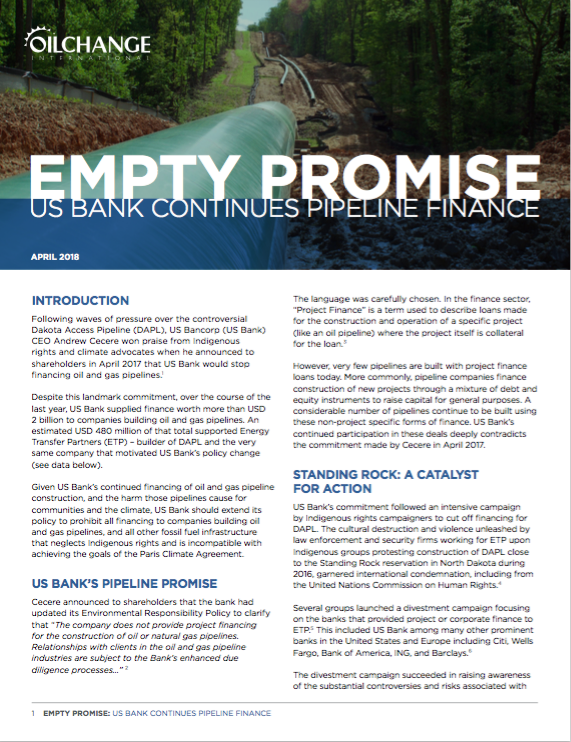 Given US Bank’s continued financing of oil and gas pipeline construction, and the harm those pipelines cause for communities and the climate, US Bank should extend its policy to prohibit all financing to companies building oil and gas pipelines, and all other fossil fuel infrastructure that neglects Indigenous rights and is incompatible with achieving the goals of the Paris Climate Agreement. I have been a long time customer of US Bank. Unfortunately I will not be able to continue a US Bank customer unless their policies change dramatically. Yes I have an account with US Bank and will be closing it as long as the bank finances pipelines that don’t belong. These pipelines are detrimental to the soil, air and water and to the people who live in these areas! I HAVE AN ACCOUNT WITH US BANK WHICH I’M LEGALLY REQUIRED TO HAVE. I WOULD NOT BANK WITH THEM BECAUSE THEY ARE INCOMPETENT AND GREEDY. WHEN SOME BANKS CLOSE CHECKING ACCOUNTS THEY CHARGE SAY $25 FOR THIS. THERE WAS A BILL IN CONGRESS TO PREVENT THIS. IF YOU HAVE A TRUST ACCOUNT WITH USB THEY WILL CHARGE YOU 1000 DOLLARS IF YOU CLOSE IT.! I just joined Chime, little did I know until I began to link them to my Paypal & Venmo that they were affiliated with Bancorp / US Bank and NOW will NO LONGER BE BANKING WITH THEM HAVING SEEN THIS.